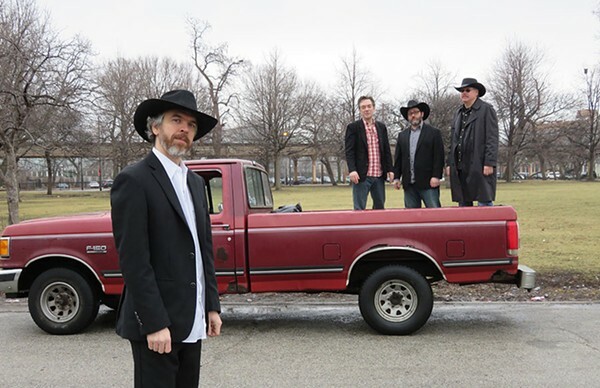 Dan Whitaker & the Shinebenders recently released the album Truck Ride. If there's a harder-working local band than country quartet Dan Whitaker & the Shinebenders, Gossip Wolf doesn't know 'em! After honky-tonkin' through one of their two-hour Saturday sets at Cole's, this wolf is usually tonked out—especially regrettable when Dan and the band go on to play from 10 PM till 1 AM at Bernice's Tavern in Bridgeport the same night! As if their endurance didn't do the trick, the 'Benders prove they're the real deal with the new LP Truck Ride, which includes bouncing, steel-guitar-laced instrumental "Stony Island Stomp" and barreling barroom belter "Booze Is Good." You can buy a CD at Cole's on Saturday, June 18, or at the next Cole's/Bernice's doubleheader on Saturday, July 2. On Sunday, June 19, Experimental Sound Studio hosts the ninth annual Experimental Garage Sale, featuring wares from electronic-kit makers, circuit benders, and homemade-­instrument builders. There's no cover, and a raffle of items donated by vendors benefits ESS. Chicago has no shortage of summer music festivals, and by the end of the season many become a blur of portable toilets, expensive hot dogs, and sets by 16 Candles. But Gossip Wolf is still interested in a few, including the brand-new Myth Fest, which runs Saturday and Sunday, June 18 and 19. It calls itself a celebration of international electronic music, and its name is inspired by Greek mythology—though it's at the Irish American Heritage Center. The bill includes Swedish producer Jonas Rathsman, UK duo Waze & Odyssey, and Chicago acts such as hip-house innovator Tyree Cooper, experimentalist Hieroglyphic Being, and Steve Mizek and Savile as Argot Soundsystem.